It is the weight applied to a specimen which causes a tension to be developed in the specimen. It is the load at which the specimen breaks, usually expressed in grams’ weight. It is the ratio of the force applied to the cross-sectional area of the specimen. The cross section of many fibres are irregular in shape and difficult to measure. To simplify matters, a dimension related to cross-section is used, such as the linear density of the specimen. The linear density of a specimen may be expressed in denier or tex unit; then the mass stress becomes the ratio of the force applied to the mass per unit length. The units of mass stress, therefore, become gram per denier (gpd) or gram per tex (gpt). The tenacity of a material is the mass stress at break. The units being, of course, grams per denier or grams per tex. An alternative term for tenacity is a specific strength. It is useful to note that by expressing the breaking strengths of different materials in terms of tenacity, a comparison can be made directly between specimens of varying fineness. When a load is applied to a specimen, a certain amount of stretching takes place. The amount will vary with the initial length of the specimen. The strain is the term used to relate the stretch or elongation with the initial length. This is expressed in percentage. It is the ratio of extended length to the original length of the specimen, expressed as a percentage. The extension is sometimes referred to as the strain percentage. The breaking extension is the extension of the specimen at the breaking point. It is the ratio of breaking stress to breaking strain. Young’s modulus gives a measure of the force required to produce a small extension. A high modulus indicates inextensibility and a low modulus indicates great extensibility. In textiles, the term initial modulus is used to describe the initial resistance to extension of a textile material. In other words, this is a measure of fibre’s resistance to small initial extension. When the fibre has high resistance to stretching, it will have high modulus. High modulus indicates inextensibility and brittleness. Low modulus fibre requires little force to stretch it. It is also an indication of flexibility. The initial modulus is a very important part of stress–strain curve. If the initial portion of the curve is straight, it indicates a linear relationship between stress and strain. The material behaves like spring and obeys Hook’s law. The significance is that when the load is removed the material recovers its original length. If the stress is in units of grams per denier, then the initial modulus will also be in grams per denier because the strain is a number and is dimensionless. It is defined as that property of a body by which it tends to recover its original size and shape after deformation. Elastic recovery is often expressed as a percentage. Perfectly elastic materials will have an elastic recovery of 100% while perfectly plastic materials will have a zero recovery (i.e. 0%). The elastic recovery of different fibres shows considerable variations. Also, the same fibre may show variable recovery depending upon the degree of extension and the relative humidity. The amount of extension or stretch that a fibre accepts is referred to as elongation. Elongation at break is the amount of stretch a fibre can take before it breaks. Elastic recovery indicates the ability of fibres to return to their original length after being stretched. A fibre with 100% elastic recovery will come back to its original length after being stretched to a specific degree for specified period of time. After removing and re-measured. The load-elongation curve describes the mechanical response of the specimen from zero load and zero elongation up to the breaking point. From a close study of this curve important information on its mechanical behaviour, like elastic modulus, yield point, tenacity and elongation can be obtained. Moisture regain is defined as the weight of water in a material expressed as a percentage of its oven-dry weight. Moisture content is the weight of water in a material expressed as percentage of its total weight. Shape of a fiber include, its longitudinal sections, cross section, surface contour, irregularities and average length. It refers to the sheen or gloss that a fiber possesses. It is directly proportional to the amount of light reflected by a fiber. This in turn is affected by their cross section shape. 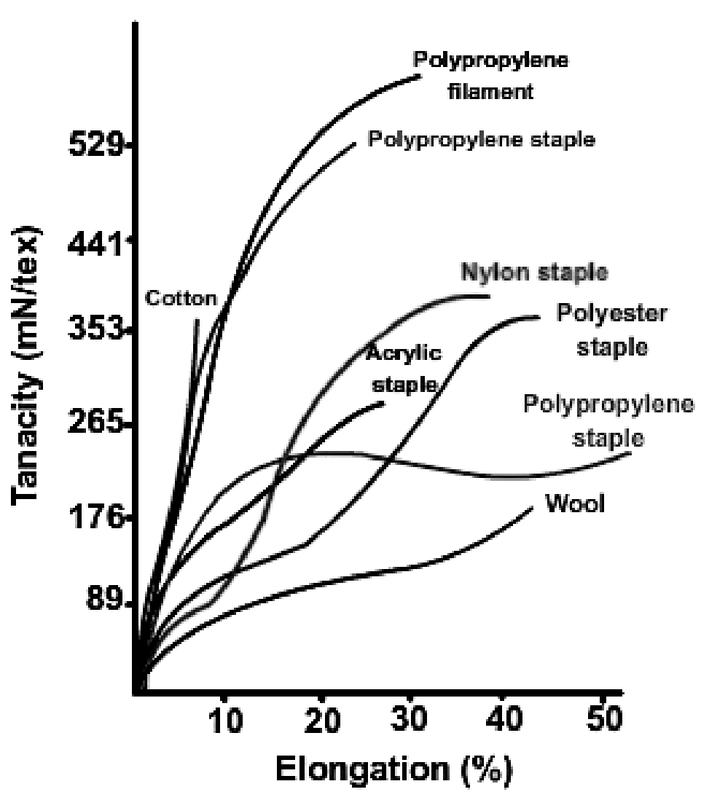 Among the natural fibers, silk has a high luster, and cotton has low. The specific gravity of a fiber is the density related to that of water (at 4 degree celsius ). The density of water at that temperature is 1. fiber density will affect their performance and laundering. If the specific gravity of a fiber is less than 1, it will float in water, making its washing and dyeing very difficult. E.g. Olefins fiber. A related property is density which is defined as the mass per unit volume and measured in g/cm3. Absolute humidity is defined as the weight of water present in a unit volume of moist air. Relative humidity is defined as the ratio of the actual vapor pressure to the standard vapor pressure at the same temperature expressed as percentage.